Hornell Municipal Airport (KHTF) is located a few miles north of the city on Route 36. The airport has a hard surface runway capable of landing small jets, a rotating beacon and fuel. 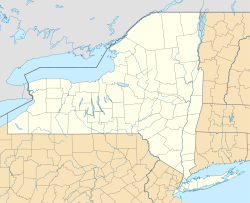 What is now Hornell was first settled in 1790 under the name "Upper Canisteo", to distinguish it from the community of Canisteo, then known as "Lower Canisteo". The family of Benjamin Crosby were the first settlers in what is now Hornell. The area was incorporated as a town in 1820, as "Hornellsville." The name comes from early settler George Hornell Jr, who built the first gristmill here. The 2011 Saint Patrick's Day parade in Hornell. The City of Hornell was chartered in 1888 as the "City of Hornellsville," (having been first organized as the "Village of Hornellsville" in 1852). The name was changed to Hornell in 1906. Major flooding in 1936 put parts of the city under water, prompting the creation of a system of levees to prevent future serious flooding issues. The former city park, Union Park, was destroyed by the urban renewal of the 1970s. In 1950, Hornell had a population near 16,000 people. It had two radio stations, WWHG and WLEA, and three movie theaters, the Steuben and the Majestic, located on Broadway, and the Hornell, located on Main Street. The current mayor of Hornell is Republican John Buckley. In 2009 Kirk W. House produced Around Hornell, a historic photo book in Arcadia Publishing's "Images of America" series. Around Hornell also includes the surrounding rural communities of Canisteo, Dansville, Fremont, Hartsville, Hornellsville, and Howard. The Hornell Armory, Hornell Public Library, Adsit House, Lincoln School, St. Ann's Federation Building, and United States Post Office are listed on the National Register of Historic Places. The New York and Erie Railroad arrived in Hornell in 1850, which connected New York City and Dunkirk on Lake Erie via a Southern Tier route. Another route, the Buffalo and New York City Railroad, was added in 1852, branching from Hornell northwestward to Buffalo. For the next hundred years Hornell enjoyed prosperity, with its steam engine shop doing the repairs for the entire Erie railroad line. The most important point in town was the train station, which survives. Next to it were the police station and fire department, at the beginning of Broadway, a wide street with stores, a luncheonette, and the Steuben and Majestic Theaters. Heading south, Broadway ended at Canisteo Street just before it passed under the tracks, a route served for some decades by a trolley. The underpass was closed, save for a pedestrian passage, when the Route 36 arterial was built. At the five-way intersection just north of the underpass, where Broadway began, Canisteo Street ran northwestward. Near its southern end (now covered by the Route 36 arterial), was Hornell's largest hotel, the New Sherwood, the offices of the Hornell Evening Tribune and above it those of its radio station WWHG. On the east side was a storefront Greyhound station (service Elmira - Corning - Bath - Hornell - Batavia - Buffalo, no direct service to Rochester); on the west side was Hornell's main park, Union Park, with the city's high school (middle school after new high school built), containing the city's largest auditorium, and other businesses. Main Street, with the Hornell Theater, WLEA's studios, Koskie's music store, and other businesses, connected the two now-separated streets (Broadway and Canisteo/Seneca ). Main St. extended east to Hornell's Carnegie Library (Hornell Public Library), Hornell's largest grocery store, Loblaw's, the YMCA, with the only public swimming pool in the city, various medical and dental offices, and finally (turning south and crossing the Canisteo River), the Erie Repair Shops. North of Main Street the downtown area extended another block with the city's pharmacy, Jacobson's shoe store, the United States Post Office (both now  vacant), and the Steuben Trust Company (bank). In the block north of Main Street, Church Street had Hornell's synagogue, Temple Beth-El (closed), and at the intersection with Genesee Street four churches, one on each corner; two survive today (2017). Further north on Seneca Street were Hornell's best restaurant, the Big Elms, Hornell's baseball field (from 1942 to 1957 Hornell had a minor-league team), and car dealers. The current high school is adjacent to the baseball field. The city ended at the Canisteo River, where a bridge led to the village of North Hornell. In October of 1960 the Erie merged with the Lackawanna, and the Hornell repair shop was closed, with repair operations consolidated at the Lackawanna's Scranton facility. The railroad then came upon hard times as trucking picked up more and more of the freight business. In 1972, the company filed for bankruptcy Just a few days after floods from Hurricane Agnes destroyed about 200 miles (320 km) of roadbed along the Canisteo River, removing all hope of reoperating the railroad line east of Hornell. Passenger service, in severe decline, ended completely by 1970. The former station has been refurbished and is now (2017) the Hornell Erie Depot Museum. Hornell has today (2018) less than half the population it had in 1960, and it is still dropping. As the population dropped businesses closed; civic institutions such as churches were also affected. Hornell has struggled to regain its former prosperity. The former Erie shops are now Alstom's main North American assembly and manufacturing site for the production of AC traction motors, railway cars, and passenger locomotives. Car bodies are shipped disassembled from São Paulo, Brazil and assembly into cars takes place in Hornell. Prior to Alstom, the shops were operated by Morrison Knudsen. After a difficult period Alstom Transport won a contract worth $194 million USD to execute the complete overhaul of Philadelphia's Port Authority Transit Corporation (PATCO) light rail fleet, beginning in 2011. In 2013, the Alstom facility was contracted to build 34 light rail vehicles for delivery to Ottawa by 2018. Hornell's central layout was changed significantly by the construction of the New York Route 36 arterial in the 1970s. Prior to that, Route 36, Hornell's main north-south highway, was routed along Seneca Street (to the north) and Canisteo Street (to the south). Neither of these streets was adequate for the increased automobile and truck traffic which accompanied the decline of the railroad, and they could not be easily expanded; Canisteo Street also had a significant bottleneck (originally the "Canisteo Subway" on the Hornell-Canisteo trolley, pictured on a postcard) where the route went under the Erie Railroad tracks, just south of downtown. Route 36 between Hornell and Canisteo, also inadequate, could not be expanded due to the adjacent Canisteo River. The decision was made to replace the route with an arterial, west of Seneca Street on the north side, crossing the downtown and exiting Hornell east of Canisteo Street on the south side. The four-lane route was continued to Canisteo, at a higher and geographically better location than the old route. Unconnected fragments of the former Route 36 from Hornell to Canisteo survive; in Hornell it starts from East Avenue, east of the river, and in the Town of Canisteo it is today Dineen/McBurney Road. The impact of the relocation of Route 36 on central Hornell was profound. Much of the south end of the downtown was destroyed. Seneca Street and Broadway, formerly important commercial streets, became deserted. (See United States Post Office (Hornell, New York).) Part of the city's central park (Union Park) was taken for the highway, with the remainder paved to create public parking lots. Canisteo Street became unconnected at both ends. When the decision was made in the 1960s to upgrade the western portion of New York Route 17 to expressway status, it was decided to route the expressway through the Hornell area, as it was considered to have more prospects for development than Greenwood and Jasper, along the old route (now New York Route 417). Interstate 86 crosses Route 36 between Hornell and Arkport. It is today Hornell's main highway. Hornell is located at 42°19′N 77°40′W﻿ / ﻿42.317°N 77.667°W﻿ / 42.317; -77.667 (42.3244, -77.6603). Hornell is at an altitude of 1,160 feet (354 meters) above sea level. According to the United States Census Bureau, the city has a total area of 2.7 square miles (7.0 km2), all of it land. Canacadea Creek, a tributary of the Canisteo River in a residential neighborhood of Hornell. New York State Route 21 conjoined with New York State Route 36 passes through the city, which is just south of the Southern Tier Expressway (Interstate 86 / New York State Route 17). County Roads 65, 68 and 109 also lead into the city. The City is served by two railroads - it is on the Norfolk Southern's Buffalo-East Coast mainline and is the eastern terminus of the mainline of the Western New York and Pennsylvania Railroad. As of the census of 2000, there were 9,019 people, 3,596 households, and 2,218 families residing in the city. The population density was 3,309.0 people per square mile (1,275.6/km²). There were 4,100 housing units at an average density of 1,504.2 per square mile (579.9/km²). The racial makeup of the city was 95.73% White, 2.38% African American, 0.23% Native American, 0.57% Asian, 0.04% Pacific Islander, 0.38% from other races, and 0.67% from two or more races. Hispanic or Latino of any race were 1.29% of the population. There were 3,596 households out of which 32.4% had children under the age of 18 living with them, 40.9% were married couples living together, 16.1% had a female householder with no husband present, and 38.3% were non-families. 32.0% of all households were made up of individuals and 14.3% had someone living alone who was 65 years of age or older. The average household size was 2.44 and the average family size was 3.07. In the city, the population was spread out with 27.7% under the age of 18, 9.7% from 18 to 24, 27.0% from 25 to 44, 19.7% from 45 to 64, and 16.0% who were 65 years of age or older. The median age was 35 years. For every 100 females, there were 89.0 males. For every 100 females age 18 and over, there were 82.9 males. The median income for a household in the city was $28,184, and the median income for a family was $35,000. Males had a median income of $31,727 versus $18,854 for females. The per capita income for the city was $14,419. About 18.7% of families and 21.4% of the population were below the poverty line, including 32.1% of those under age 18 and 6.6% of those age 65 or over. Maple City Park is adjacent to the Hornell High School and is maintained by both the school district and the city. It includes tennis courts, a baseball field, softball field, multiple half-basketball courts, a playground, a 6-lane rubber track, and a turf field (football and soccer). It is the home of the Hornell Dodgers NYCBL baseball team and the Hornell Red Raider athletic teams. Hornell's annual "Music Under the Stars" drum and bugle corps event also takes place on the turf field at this site. Prior to the construction of the high school, the park was the home of the minor league baseball team Hornell Dodgers (1942–1957). Veterans Memorial Park at James Street (formerly known as simply James St. Park) has many sports fields, pavilions, the city pool, and several playgrounds. 4 July celebrations, including fireworks, are located at this park. Michael C. Fucci Memorial Park at Shawmut is where the Hornell skate park is located. Many youth football and baseball games are also played on the fields. There was, at one time, an effort for Rails to Trails to create a bike/hike trail from this park northwestward. There are five public schools and one private school located in Hornell. (The North Hornell School is physically located in the village of North Hornell, but is still a part of the Hornell City School District). St. Ann's Academy is an independent Catholic school serving grades PreK - 6. It opened in 2012 after St. Ann's School was closed by the Diocese of Rochester. The current Superintendent of Schools is Douglas Wyant Jr. In June 2007 the Hornell Evening Tribune newspaper announced that a school planning committee is proposing a $100,000,000.00 project to re-organize the schools and improve assessment results. The NY School Report Card for the Hornell City School District can now be found at the NYSTART site. Hornell is served by buses operated by Hornell Area Transit. ^ "PATCO's entire metro fleet to be modernised between Philadelphia and Southern New Jersey" (Press release). Alstom. June 2, 2011. Retrieved 2013-06-16. ^ Vantuono, William C. (February 14, 2013). "Alstom finalizes Ottawa LRT contract". Railway Age. Simmons-Boardman Publishing Inc.
Wikisource has the text of the 1911 Encyclopædia Britannica article Hornell.